The small creature flew up to the aperture before being blasted away by moist, hot air. 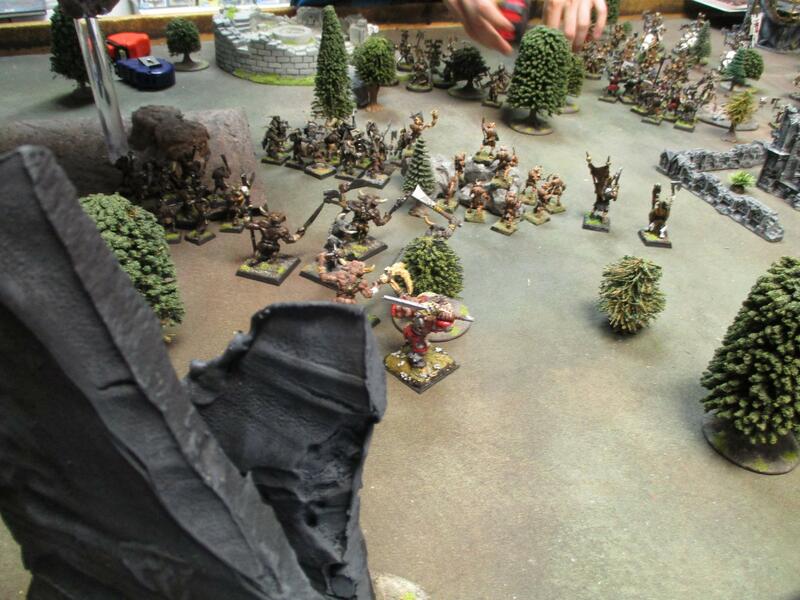 The small fly flew away from the massive Beastlord as the latter growled in anticipation of the coming fight. Surrounded by his bodyguard Ghaka sent over the final dispositions for meeting the enemy. All of his forces moved into position, it had been a long time since he had seen his brother. Now it seemed as though Graluck wanted to rule the bray herd and was willing to consort with outsiders to do so. In the shadow of the floating island Ghaka looked out through the lightly wooded plains and could see the enemy approaching. Their march was audible before their banners were visible. The musical clink of chains and brazen armour resounding over the veld. 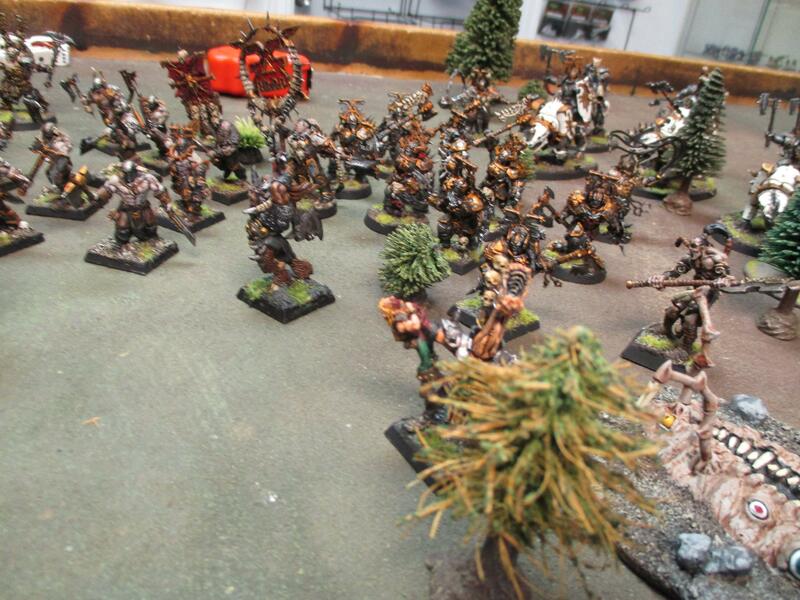 Indicating with his axe Ghaka sent his skirmishers forward. 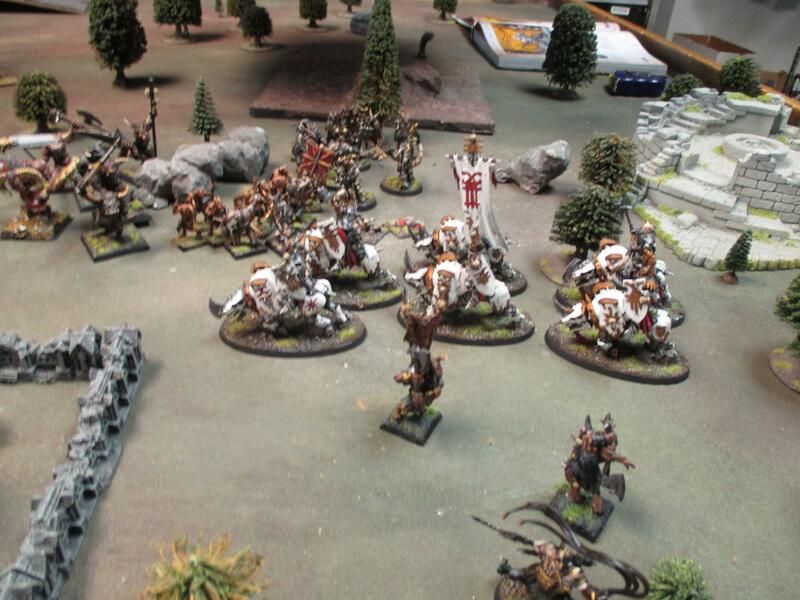 They loosed arrows at the Khornate champion standing beside Graluck. The swarm of arrows descended on the champion as he charged forward eschewing any attempt at hiding from the stinging missiles. He emerged from the dousing with arrows protruding from all over his armour and leaking a steady trail of blood behind him. Graluck had noticeably slowed his pace in the advance and avoided any chance of being injured. A loud war cry bellowed from his lungs and Ghaka urged his forces onward. Magrack began a weird dance and, as he moved inscribed a circle in the air with his staff, a weird glowing tail followed the skull on the top as he did so. It hung impossibly in the air before Magrack poked his staff through the center of it in the direction of Ghaka's now charging bodyguard. The circle fell on them and they started to slightly shimmer with energy as they smashed into the center of the enemy line. The bodyguard would be the horns of this attack. They were aimed straight at Graluck. 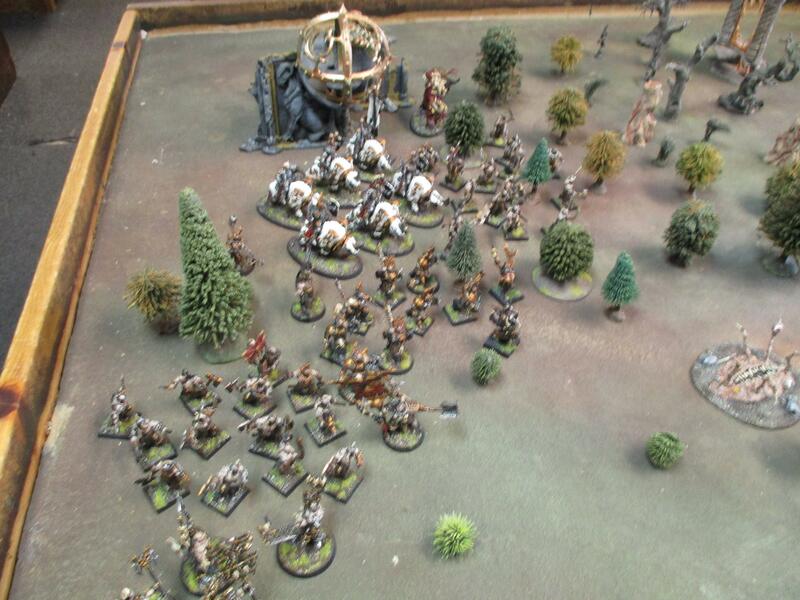 They smashed into the champion of Khorne first and his whirling attacks were somewhat blunted by the static hindrance of the arrows protruding from him. Quickly the bestigors dispatched him with their great axes. 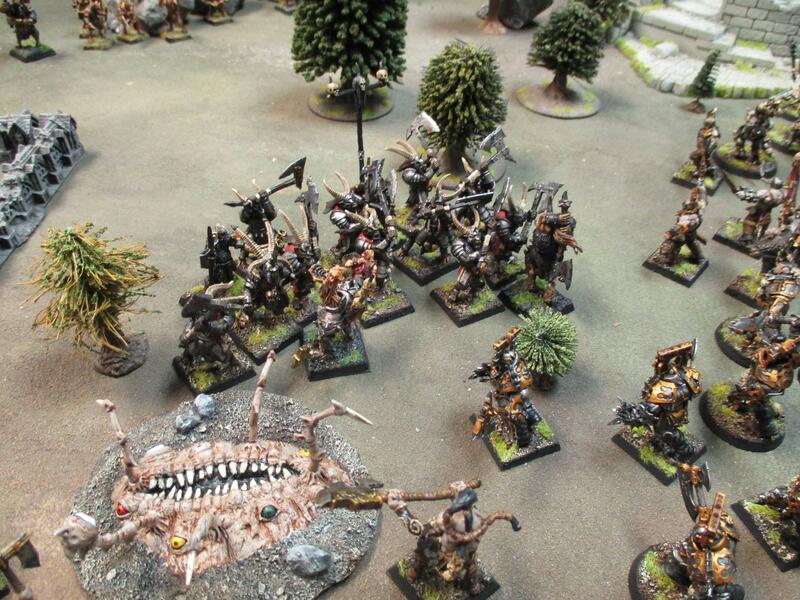 Graluck found himself fighting alone against his brother's bodyguard but soon his allies joined the fray and men and beastmen joined each other in pools of blood on the ground, shattered in form and raggedly breathing out their last. 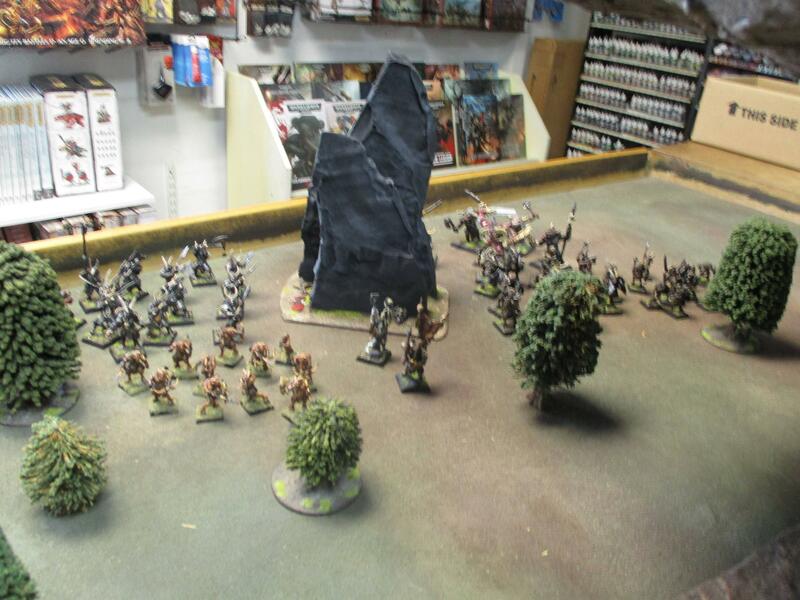 The skirmishers continued to fire arrows at the approaching Khorne forces felling a number of the berserk murderers before they managed to get in amongst the smallest of the beast men. 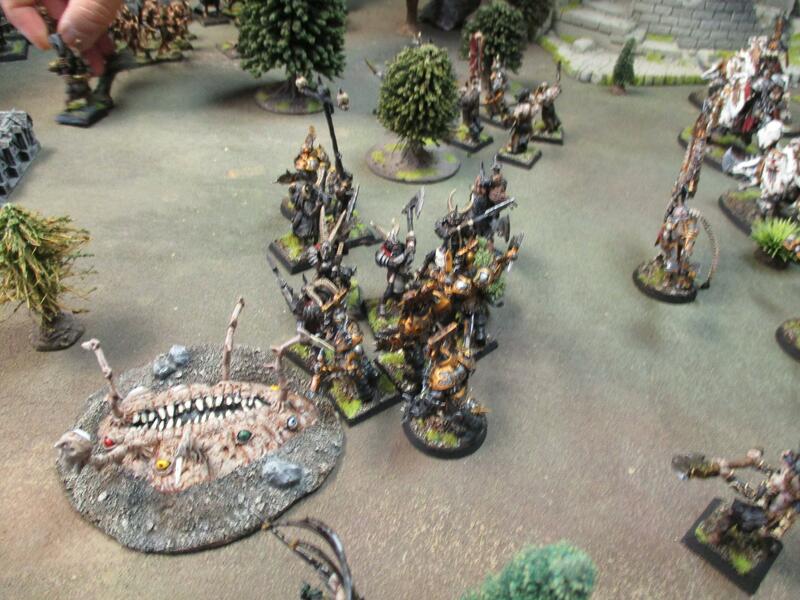 It was a slaughter when they did though and, despite their small numbers, the Khorne forces were able to even the odds quickly. 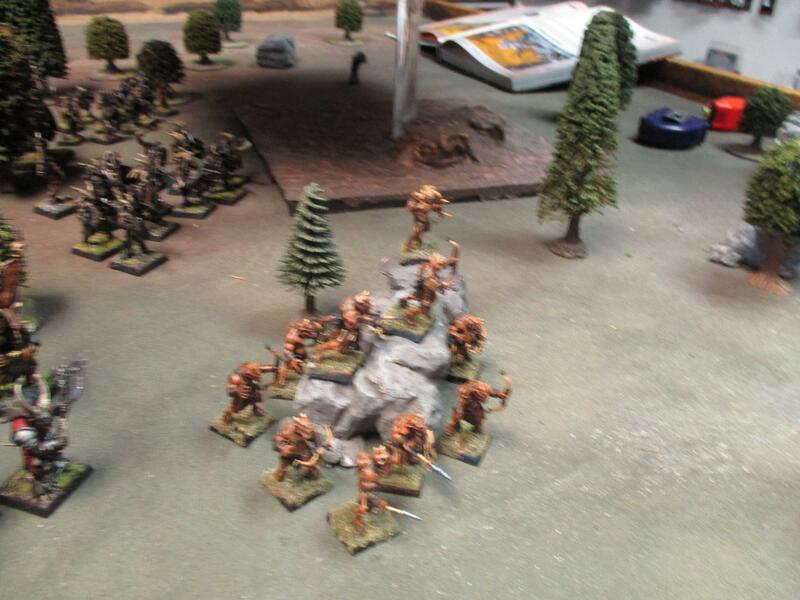 The main body of Ghaka's force advanced in two columns up the left and the right, they were followed by the minotaurs heaped in reserve. As planned the forces pulled the Khorne forces away from the center where the body guard was cutting a bloody swath through anything that stood in their way. 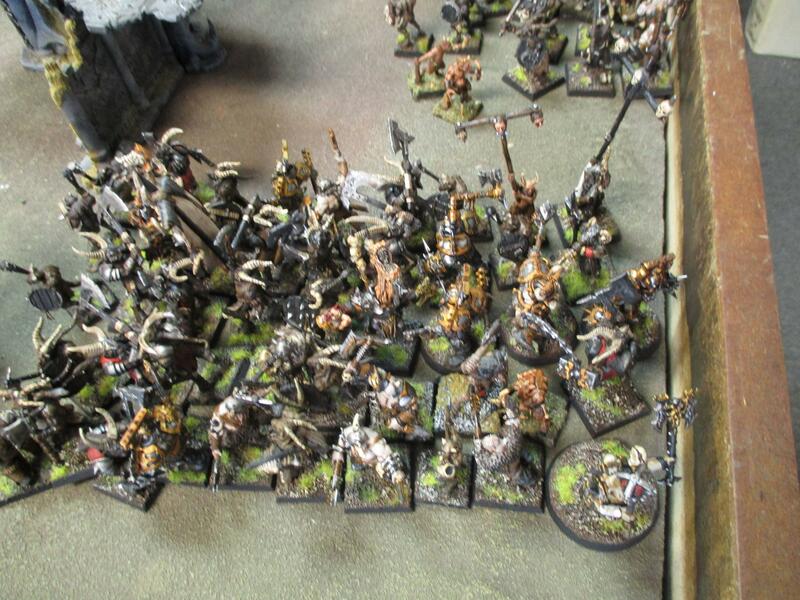 Graluck was bleeding from a number of wounds as he smashed into the ranks of the beast men he soon hoped to command. Five massive mutated berserkers charged into the leftmost of Ghaka's troops in a whirl of blades creating a tornado of death. Parts were stripped from bodies as the Khorne warriors descended into screaming madness and exultation in the slaughter. 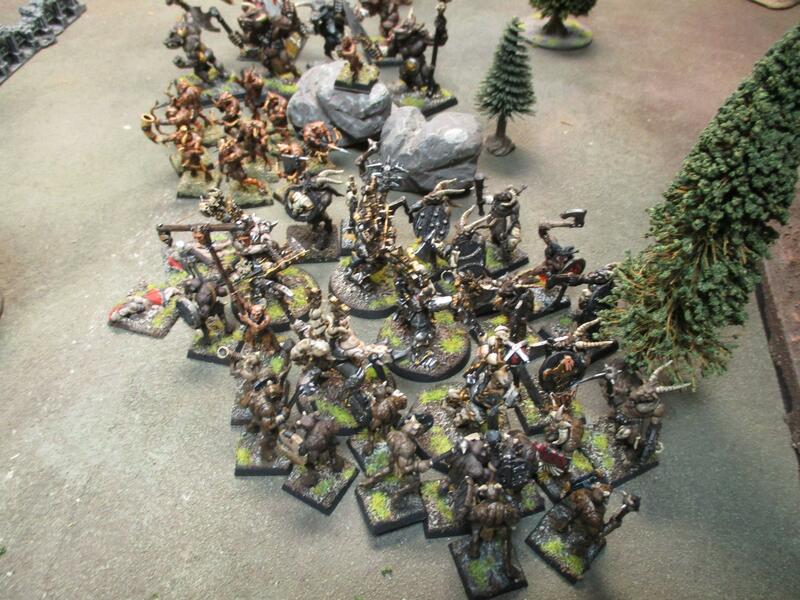 As more and more blood was spilled the warriors seemed to become more energized and their prowess increased. 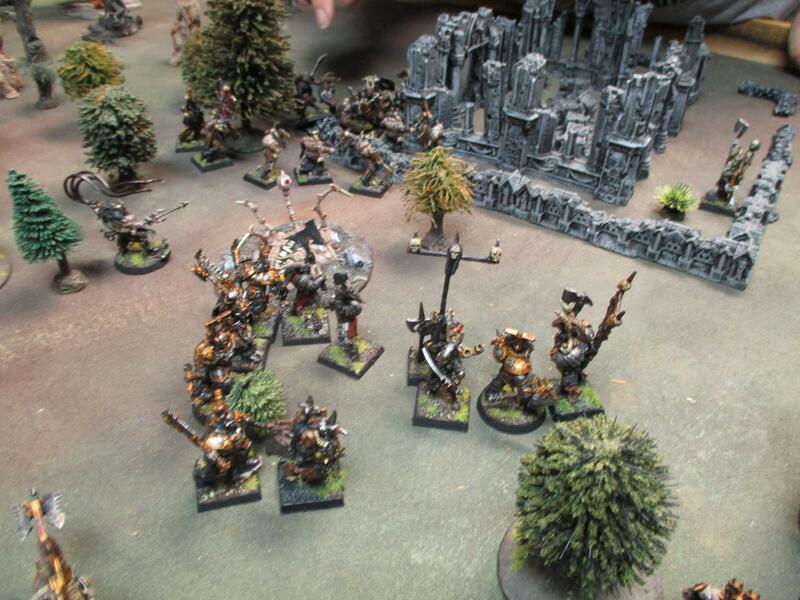 There was blood flying everywhere and the worshippers of Khorne, lead by their slaughter priest began to chant. The chanting reverberated through the bodies on the ground as well as the creatures fighting. Each could feel an unnatural tightness in their chest and the horror of all horrors gripped their minds as the flying blood started moving towards the rear of the chaos line and coalesced slowly into a massive form of solidified murder. Skarbrand stood bellowing out his rage at all around him. Of the ones closest to him both men and beast men alike felt something cold move down their spine as they felt waves of pure animosity wash over their skin. 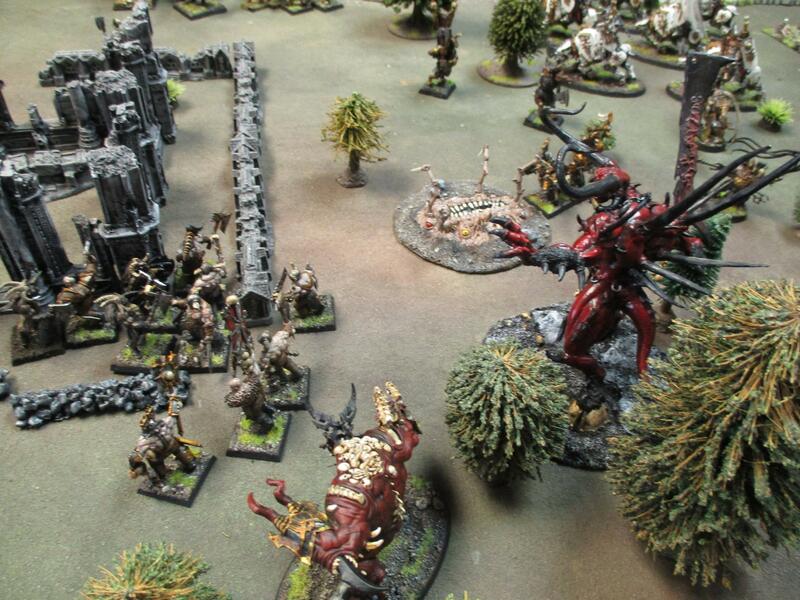 Those more dedicated to Khorne, and not completely absorbed in the slaughter began to grin. Graluck slew the last of his brother's bodyguard and turned around to see Ghaka running at him. An armoured Khornate champion interposed himself swinging his massive anvil on a chain at the Beastlord. Ghaka was focused on his target and failed to avoid the massive weapon that slammed him to the ground and rolled him over twice before he regained his feet. With crushed ribs and blood flowing from his mouth he bellowed in defiance at his attacker who came on. He dodged the second blow, leaping into the air in the last second and brought his massive axe down on the head of his assailant splitting helmet and warrior in twain. While the battle raged around them or warriors were distracted by the incarnate hate that had formed among them the two brothers circled each other. Graluck hesitated and looked to see if he had could rely on any support. There was none forthcoming. His allies had not come to help him gain a throne but to slaughter as many foes as they could. The hesitation was all that Ghaka needed. He hurled his axe with both hands at his brother. The hit was not true but it staggered Graluck and he dropped his own weapon at the impact. Ghaka was quickly following his weapon and caught his brother's weapon just as it hit the ground, bringing it up in a swing that decapitated the rebel. Ghaka held his brother's head aloft bellowing his victory. His celebration was only momentary and he gathered his remaining forces and started to retreat. 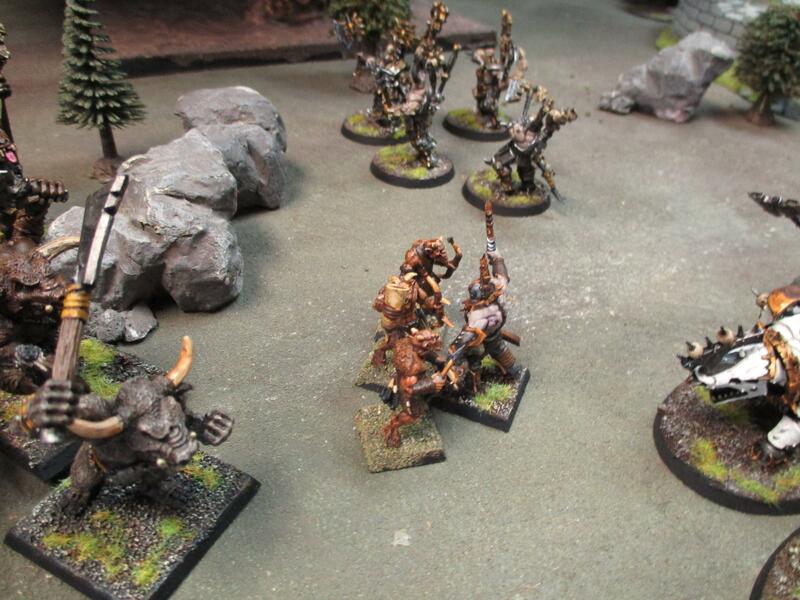 The Minotaurs took up a rear guard position, their desire for slaughter almost matching that of their opponents. Both would be well satisfied by the end of the day. As much as I am upset with GW for killing off WFB in a bid to establish trademarks and feed off 40k, I like what a couple of you guys are doing with these narrative campaigns. The rules don't matter to me as much as the story and having fun. Keep up the good work. Yeah, I've never been one that has been too critical of the rules themselves as long as they don't bog down too much. AoS really doesn't do that. Here is a picture of the close combat deaths only in this game after turn 3. 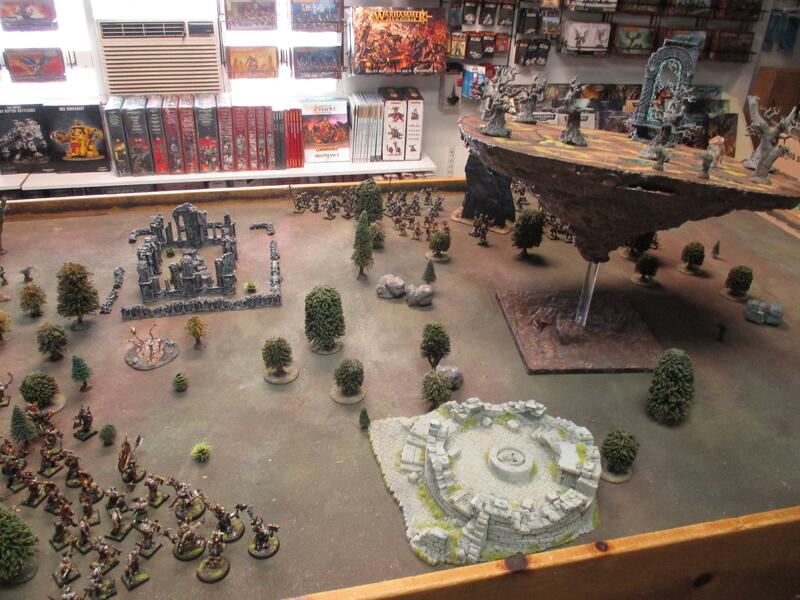 For me the scenarios are the best part of AoS. They have all been fun to play so far. We used the Clash of Heroes scenario for this game and it worked out pretty well. The scenario pretty much determined the narrative. If anything it felt very Homeric while we were playing.